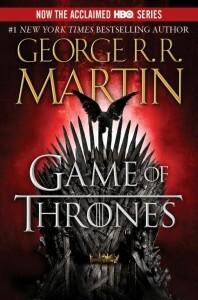 Coming in March... a new TV tie-in edition of A GAME OF THRONES for season three. The new cover will be available on both mass market and trade paperback formats, I believe. Maybe on a hardcover reprint as well, though I am less sure of that. When I know for certain, I will pass along the info here. FURTHER INFO. Ok, got a clarification. This new artwork will appear on the paperbacks, both mass market and trade. The hardcover will retain its present cover. Also, a repackage of A STORM OF SWORDS is also in the works, and will feature key art from the HBO series. I will post that here when it's ready. You've previously mentioned the postponements of the Bantam paperback is at the request of the booksellers. It was postponed a fourth time and now the current release date is 10/29/13. Is there anyway they could stop putting out these false release dates and wait until they have come to a decision to actually release it? Many fans are clamoring for TWOW preview chapter ever since you confirmed it is not the Arianne or Theon chaper we have all read. Is it the Aeron chapter you were going to read at Worldcon in 2011? I would not call them "false" release dates. They are real release dates. But yes, the date keeps getting pushed back. Bantam, like all major publishers, does not sell directly to the readers, but rather to bookstores. We want to please the booksellers, especially the 600 pound gorillas like B&N and Amazon who buy hundreds of thousands of copies. And B&N and Amazon keep asking us to hold up the mass market, since the hardcover is still selling so strongly. (A "problem" most writers would kill to have). And hey, I just gave you guys the Arianne chapter. Let that one hold you for a while. looking forward to the cover for A Storm of Swords!! Is this the first book? Did they change the name for simply Game of Thrones? yup! They changed it with the first tie in of book 1 with Eddard Stark on the cover too. I hope all your older books get reprinted too. Must be at least mildly exciting, after so much success. You mentioned in Dreamsongs that you had the option to buy the cover art for one of your first stories for $200, I think, and had to pass - but it was now going for $20k. Now that you can afford it, do you have cover art on your more recent works? I have a lot of original artwork based on my stories and books, yes. I love SF and fantasy art. Especially if it features my own worlds and characters. I have a friend, Ed Parker Jr., who does some great work in those genre. I'm about to send out a manuscript - not in those genre. If it's not picked up and I publish it myself, Ed has agreed to design the cover. Thanks for creating such great stories and characters. I can't imagine the amount of work that goes into fashioning them. I always hated reading. Until Game Of Thrones came by. I'm 12 years old, and used to always love reading comic books and loathed novels. Until i Game Of Thrones peaked my interest. I began to read Game Of Thrones, and i surprisingly loved it despite my past experiences. I was awfully engaged into it, reading page by page and word by word. I continued into Clash Of Kings, Storm Of Swords, Feast For Crows and then a Dance With Dragons. Game Of Thrones began my reading spree. I started reading books and books, more books than my educational teacher has even desired. My teacher had been surprised that i've been reading it at this age, since it had mature content. It boosted my writing and reading skills quite a bit. It was amazing, how much Game Of Thrones teached me in literacy and similar aspects. i just wanted to give you a thanks, for all the help you've given me for the past few years. Looking forward to The Winds Of Winter! You hear that George you're the new Dr. Seuss! Dr. R.R. Martin, sounds like a drama coming to NBC this fall. This is the number one all-time most important response a writer can have. Keep it up, and good luck! When will the next book be released? Is there a date or a space of time known? Ahhh...that's the question isn't it? Bearing in mind that Book 5 came out in 2011, and that George has other things to his life, aside from that series, I'm going to guess and say 2014 sometime...possibly 2015 at the latest. side note - I had a dream the other night, where I was in a big 'gorilla' book store. There was a table, where George sat, and like 2 or 3 other people. That was it!! No massive lineups, nothing. In my dream I recognized him, and we spoke for about 10-15 minutes. About what, I can't recall, but I was not drilling him about Ice and Fire / Game of Thrones (nor would I ever). We talked about sports, food, drink, and writing in general. At one point, 'dream George' said that Book 6 will be released June of 2014. I still preferred the old covers that had actual artwork on them. My first copy of GoT actually looked like a fantasy novel, with art covering the entire cover! Then they went to the small window of artwork design, which was still better than none.